The beetle pictured just above is not the intended subject of today's post. 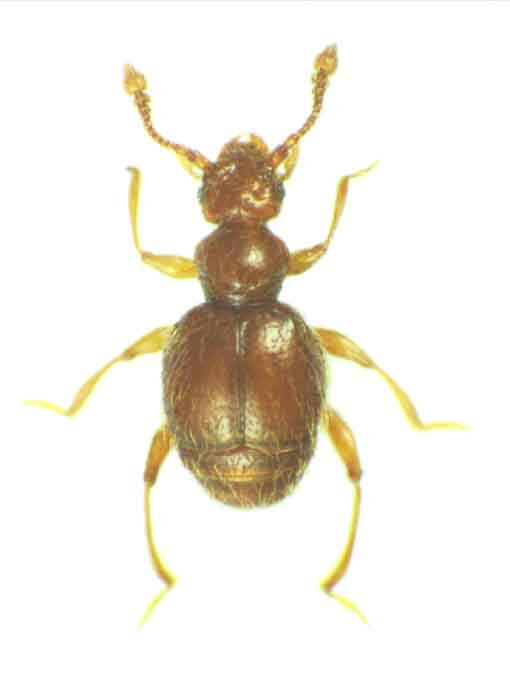 It is a related beetle found in Thailand, but I've used its photo instead of one of today's subject because, as far as I have been able to find, today's subject has never been illustrated. It was described as Dalmodes ensipes from San Esteban in Venezuela by Raffray in 1891, before it became de rigeur to illustrate any new species described (Raffray did illustrate a number of other species described in the same paper, but not this one). It has since been recorded from Antigua and Trinidad in the West Indies by Park et al. (1976), who also indicated that it should be placed in the genus Buris instead of Dalmodes, but did not illustrate it. Park (1942) had previously placed it in the genus Bythinophysis, but did not illustrate it then either. I have not been able to find any illustration of another species of Buris. Nor have I been able to find illustrations for any other species of Dalmodes, nor of Bythinophysis. Sadly, this is not an uncommon state of affairs for insect species. I did briefly consider the idea of composing an illustration of a potential Buris ensipes on the basis of Raffray's (1891) verbal description, but then I remembered that I was a rubbish drawer. 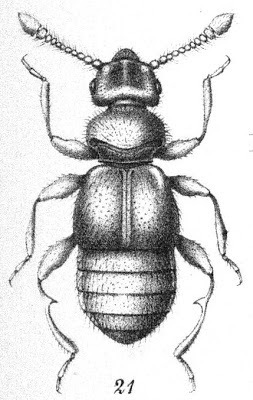 Buris ensipes is a member of the beetle group known as the Pselaphinae, of which another genus, Bryaxis, has previously been featured on this site. Like Bryaxis, Buris ensipes would probably be found in leaf litter, or possibly within rotting wood (specific collection details for Buris ensipes have not been recorded, but Park  described pselaphines as found in both habitats). Also like Bryaxis, it is probably a micropredator, though again no record of its life habits has yet been made. Buris ensipes probably looks roughly similar to the photo of Sunorfa above, but Raffrays' (1891) description indicates that it would have shorter antennae (the first segment is described as subquadrate, and the end as obtusely pointed). A curved, transverse fovea (depression) is described as present in the rear half of the pronotum, and the elytra bear a pair of subhumeral foveae (i.e. just near the 'shoulders'). The fourth abdominal segment is toothed on either side. Also distinctive is the shape of the hind tibia, which is bisinuate with a median tooth. Overall, it is just over one and a half millimetres in length. And that, as it stands, is just about all about Buris ensipes. Like all too many organisms, we have a morphological description, a few localities, and not a heck of a lot else. Buris ensipes just needs a little more love. Update: A big thank you to Stephen Thorpe, who managed to do what I couldn't and locate an illustration of a Buris species, B. brevicollis, in Sharp (1887). I've reproduced the figure below; it also tallies reasonably closely with Raffray's description of B. ensipes. Potential differences between the species are that Sharp makes no mention in B. brevicollis of a toothed fourth abdominal segment like that of B. ensipes (though one should always be extremely cautious of assuming a given feature to be absent simply because a given author didn't mention it), and that Raffray referred to the tibial spine of B. ensipes as 'minute' whereas that of B. brevicollis looks quite sizable. Park, O. 1942. A study in Neotropical Pselaphidae. Northwestern University Studies in the Biological Sciences and Medicine 1: i-x, 1-403, 21 pls. Park, O., J. A. Wagner & M. W. Sanderson. 1976. Review of the pselaphid beetles of the West Indies (Coleopt., Pselaphidae). Fieldiana Zoology 68: 1-90. Raffray, A. 1891. Voyage de M. E. Simon au Venezuela (Décembre 1887-Avril 1888). 10e Mémoire. Psélaphides. Annales de la Société entomologique de France, ser. 6, 10: 297-330, pl. 6. Sharp, D. 1887. Fam. Pselaphidae. In: Biologia Centrali-Americana. Insecta. Coleoptera, vol. 2, pt 1, pp. 1-46. Thanks a lot, Stephen! I've added a copy of the figure to this post.